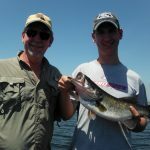 www.okeechobeejust4bass.com was fishing with Erik Hansen and his son David today on Lake Okeechobee. This was a 6 hour charter with wild shiners. Here is a picture of David and his father with David’s biggest bass he has ever caught!